Growing in Grace Podcast: 550. 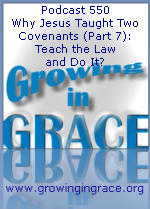 Why Jesus Taught Two Covenants (Part 7): Teach the Law and Do It? 550. 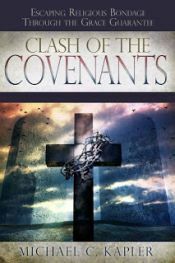 Why Jesus Taught Two Covenants (Part 7): Teach the Law and Do It? During the Sermon on the Mount, Jesus had a purpose of revealing to His disciples what the law truly required in order to attain righteousness. He was ultimately teaching that it would be futile for them to maintain the standard it demanded in order to enter the kingdom of heaven. Religion will try to make this out to be a new Christian teaching that Jesus was laying before His Jewish audience, but what He was actually laying down was the law. Jesus would begin to show they needed to find a different way other than through the works of that law.